Posted November 12th, 2018 by Sean Brown & filed under Project Focus, Technology, General. The past few years have given rise to an explosion of possibility and creativity in the performance arts as the technological systems used to deliver visually impressive stage productions have improved immeasurably. Holographic effect rear projection technology has been a focal point of this revolution, popularised by use in high profile events over the past decade. 2018 saw one of the most creative uses of Clearview yet, as part of Halsey’s live performance of ‘Without Me’ at the MTV EMAs. In this stunning music performance, we see Halsey on stage in a transparent box which is utilised more as a projection screen backdrop over the duration of the song. Visually creating the effect of surface water moving in a fluid motion, Halsey’s performance is supplemented by copious amounts of real water falling as rain, allowing her to splash and interact with the liquid in the box, enforcing the theme carved out by the Clearview projection display behind. The use of Clearview in this instance allowed the box to go from clear to producing an underwater effect for Halsey who was inside – a powerful and creative use of holographic effect film that allowed the stage to transform before the audience’s eyes. 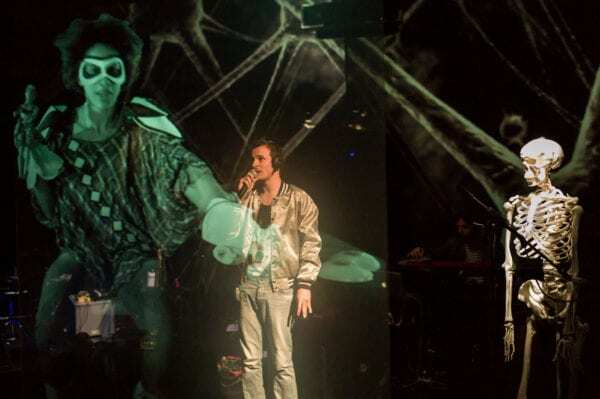 Clearview holographic effect technology allowed set designers to have the best of both worlds here – a minimalist transparent box that also doubled up as a themed backdrop for a creative and innovative music performance that was broadcast to millions. By allowing dynamic content to be used as the backdrop to such a high-profile show, Halsey was able to parallel the gradual build up to the song’s climax using not only audio and chorographical cues, but also visual cues, enhancing the overall performance and making it more immersive. But it’s not just stage backdrops and themes that Clearview technology has helped to revolutionise. Clearview’s global television debut in 2011 saw holographic effect technology used incredibly effectively at the 83rd Academy Awards, utilising its primary feature as a transparent projection screen to create both a stunning stage backdrop as well as a leading feature for a main event, which saw the ‘revival’ of the late Bob Hope projected onto the stage to ‘re’-deliver his speech from the first ever televised Oscars. By projecting onto these screens, designers are able to produce a visual impression that the content is ‘floating’ seamlessly without an accompanying screen, recreating a Pepper’s Ghost style holographic effect. The use of such technology finds its true home on stage, where the Pepper’s Ghost visual illusion was first developed for stage performances well over 100 years ago. However, unlike past incarnations of the Pepper’s Ghost effect, Clearview rear projection technology offers a simple and cost-effective alternative system with superior performance, high definition and no critical angle of projection. This amazing technology still allows visibility through the screen, displaying bright, sharp and vibrant images even in brightly-lit environments, making it ideal for stage productions of all kinds. Since the 2011 Oscars, Clearview has been specified across the world for numerous stage applications, including but not limited to theatre productions, product launches and music performances. Given the nature of holographic effect projection, it serves as a useful tool for designers and stage production managers – offering the ability to visually recreate dynamic content on stage without having to physically facilitate the items displayed. For performances that necessitate special effects, large items or exotic backdrops, this solution is ideal as these aspects are brought to life effortlessly with a high-quality transparent visual display. The Pro Display Group offers a solid range of products that will excite your customers. In addition to the product mentioned in this article, there is a wealth of information about our product options available to you on our Pro Display or Intelligent Glass websites. If you have some ideas about how you would like to integrate our technology into your displays, please get in touch using the form below, or call us on +44 (0)1226 740 663.